Building contractors esteem the employment of nondestructive testing in construction practice as useful to win additional information on the realized quality characteristics wherever necessary. Clients and supervision authorities as well want to use nondestructive testing for quality verification accompanying the construction process. With regard to the reinforced concrete structures along the new express railways of the DB AG (German Railway inc.) the client required to measure the concrete cover, to localize deeply embedded reinforcement and to check components as to eventual defects/flaws. In the contracts for new road tunnels nondestructive testing of the inner shell´s thickness will be imperatively specified. In this contribution will be reported about experiences with the use of concrete cover measuring devices, the impact-echo and the ultrasonic methods and recommendations for their use will be given. Where metallic material is worked nondestructive testing is most commonly in use. On reinforced concrete the use of nondestructive testing always needs interpretation of the data won by measuring because of the inhomogeneity of concrete. Clients tend to interprete this as uncertainness of the measuring personnel. For this reason nondestructive testing is not yet used regularly in quality assurance. Nonetheless clients and construction supervisors want the use of nondestructive testing methods - provided that their results are definite, without uncertainty. In the past only in few cases testing methods for accompanying internal quality supervision were specified in the bill of quantities. According to these antagonistic opinions the need for nondestructive testing is judged differently by the different partners in construction. 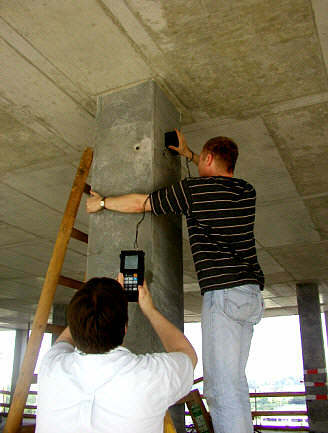 In internal supervision measuring of concrete cover of reinforcement, of temperature and of humidity are the only regularly used nondestructive testing methods. 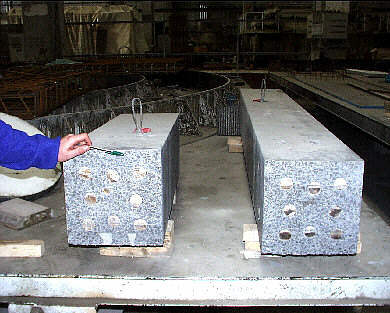 When the results of destructive testing of concrete specimen (cubes/cylinders) don't meet the expectations the nondestructive "rebound-hammer" is in use for verifying the actual strength of the concrete in situ. Ultrasonic is used regularly in order to determine the dynamic elasticity modulus in/of transmission mode . More elaborate and costlier methods like using radar, ultrasonic, impact-echo or magnetism have been used only on request by either authorities or clients . For the time being the construction industry doesn't deem it necessary to use nondestructive testing in internal quality assurance curing the construction process. A theory of quality management says: the quality of a product cannot be improved by testing. Instead it is necessary to minimize risks in the production process rather, in order to create the necessary favorable conditions for realization of the relevant properties. Nevertheless the construction industry acknowledges the need for testing methods in such cases, when production is not successful in spite of the realized quality assuring measures. It is to be remarked, that the awareness of the possibilities to verify material properties by nondestructive methods heightens the (quality) conscientiousness of the involved personnel. It is a fact, that e.g. the augmented use of cover meters has led to a significant improvement of homogeneity of the concrete cover of reinforcement, although testing of the concrete cover is only the last but one member in the chain of quality assuring measures. Nondestructive or little-destructive methods are in use for judging the quality of a defective building as well as for accompanying the repair work. The testing methods commonly used for that purpose are listed in . The demand for testing methods is being judged differently by owners and clients. Frequently the owner wants the contractor to prove the quality of construction. However, this wish is normally fulfilled in case of justified doubts only. Attempts of owners to control the quality of the developing construction by use of nondestructive methods within the scope of the accompanying internal quality supervision, should be supported. A necessary prerequisite for that is a corresponding detailed specification of the required testing in the bill of quantities.Only then all bidders have to calculate the price for that testing procedure. With respect to that we deem ideal the practice of tendering in use with road tunnels, where the public client has implemented into the contract a specification defining methods and quantities of testing as regards the thickness of the inner shell. Additional demand for nondestructive testing might arise in case new material or new construction components are intended to be used as standard, as long as there is not sufficient experience as to their probation. It would be greatly appreciated, if it was possible to verify concrete in situ with methods as simple as possible with regard to the homogeneity of self compacting, highstrength or high durable concrete. The echo-methods in use up to now enable detection of horizontal cracks or flaws, but they don't really enable localization of compaction faults or impermeability with sufficient accuracy. Examples having occurred in the near past demonstrate that nondestructive testing methods can be useful tools to prove, that necessary and promised properties have been attained. In the year 2001 the German federal agency for road construction (BAST) designed the "Guideline for the use of nondestructive testing of inner shells of tunnels", which was officially issued by the German federal Secretary of traffic by means of the the circular letter 14/2001 . The issuing letter reads "In order to control and warrant a high-quality standard with road tunnels of the closed type the thichness of inner shell shall be checked in future by means of the impact echo method or similar echo methods with regard to flaws and negative deviations from its thickness by the contractor within the scope of his internal quality supervision. The reason for its implementation was the intent to avoid defects of the waterproofing caused by unsufficiant thickness of the inner shell or by unequal thickness of the inner shell at its joints. In the past these damages caused considerable repair costs already shortly after completion of the inner shells. Only companies certified by the BAST may be entrusted with the execution of such testing in order to ensure the quality of the test results. The certification is granted after a successful qualification assessment comprising measurings on a specifically prepared sample and successful interpretation of the measuring results. For the time being the use of only the impact echo method and the ultrasonic echo method is allowed . Only qualified personnel is allowed to take the measurements in situ. The measurements are to be taken especially in the area of the tunnel soffit and along the joints at metering points along lines arranged in a recommended grid with a distance of 80 cm x 80 cm. Where anomalies have been detected, the grid will be compressed to for instance 40 cm x 40 cm. The measuring results are to be documented as specified in the guideline, graphic demonstration included. Demonstration of the thickness of the inner shell by means of contour lines is well-approved (Fig.1). Fig 1: Example for graphic demonstration of results of impact echo measuring of the thickness of an inner shell of a tunnel section. Up to now the author applied the impact echo method in more than 10 tunnels for measuring the thickness of inner shells and for structural investigation. The investigation of these tunnels has been executed according to the specification in the guideline either comprising the total length of the tunnel or expressly designated sections only. The results demonstrated justification of the investigation because all of those tunnels showed defects with regard to the thickness of the inner shell's tunnel soffit area, some more, some less. The above-mentioned circular letter contains recommendations for internal quality control measurement and also control measurements arranged by the client. In some cases, only the control measurement were assigned because only this part of work was decribed in the specification. As regards the testing services within the scope of internal quality supervision it has shown to be well-approved to describe the service items in the bill of quantities separately for each section of the tunnel, with the designer in charge determining number and location of the metering points for each section, in order to get comparable bids for the execution of the testing. The grid of the measuring lines of 80 cm is approved as appropriate too, because with this grid extended differences of thickness can be detected reliably and the costs of testing remain acceptable. In case a negative deviation of the necessary thickness has been detected the distance of the grid lines around that measuring point will be reduced to 40 cm or even less, if necessary. So the thickness can be analyzed accurately according to necessity. A former aim of the testing was the reliable measuring of the thickness of the inner shell before and after the injection of the cavity in the tunnel soffit in order to prove the success of the injection; this aim is not always attained. The accuracy of the measurements won by means of the echo method depends on the thickness of the inner shell. In the guideline the attainable inaccuracy (or: the maximum deviation) of the measuring method is specified as "mostly less than 3 % ". With 80 cm the thickness of the inner shell, the possible measuring deviation must be expected to be ± 2,4 cm. If for instance the inner shell lacks only 4 cm, the reinforcement is already unprotected by concrete and repair has to be done. This negative deviation is not reliably detectable by measuring, because it is in about the same range of size as the measuring deviation. More details with respect to the accuracy of measuring are described in . the thickness of the concrete component. Ef [%]= ± Df/2f x 100 =(1/N x Dt)/(0,96 C/2T). or with a thickness of T=60 cm to Ef = ± 3,05 % º ± 1,8 cm. The material is not specified in the guideline. Frequently chosen for that purpose are mixtures of cement and fly-ash or the like, whose density and with that also the velocity of sound differ greatly from those of the concrete of the inner shell. Depending on the quality of the concrete surface the contact with the injection material may be more or less firm. In case the fresh concrete's surface layer is formed by a mixture of cement and water caused by sedimentation of the concrete during compaction and afterwards, this layer functions as a separating layer, which will be detected by the impact echo method, so preventing the detection of the neighboring layer formed by the injection material. The results of measuring the sound velocity is subject to varianceto a certain degree. Inevitable deviations and inaccuracies may add up to such a degree that it doesn't seem possible any more to prove the success of the cavity injection in tunnel soffit. The measurements in order to prove the success of the cavity injection are executed to mostly significantly later than the measurements of the inner shell's thickness. Strength and the sound velocity of concrete grow with time, therefore the sound velocity has to be determined new accompanying each later measurement of thickness. Verification is reliably successful, however, if the inner shell's lacking thickness has been restored by backfilling with mortar or fluid concrete. The columns of a high-rising building in Frankfurt/Main was to be constructed with high-strength concrete. In order to get the permission of the building authority, the involved expert requested nondestructive testing to be included into the "normal" internal quality assurance accompanying construction. 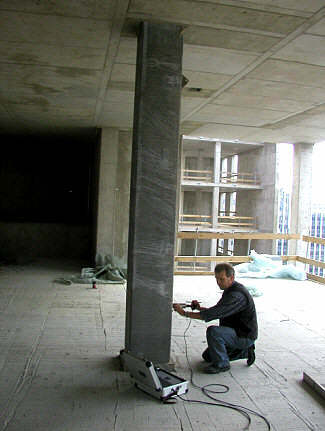 With nondestructive testing flawless execution of the high-strength concrete columns was to be proved. The columns were prefabricated professionally in a prefab-production site and consisted of high-strength steel-fiber-reinforced concrete C 120 with the addition of a special high-strength reinforcement. In order to determine the appropriate testing method as well as for its calibration a test-column (Fig. 2) was produced with specifically designed flaws. 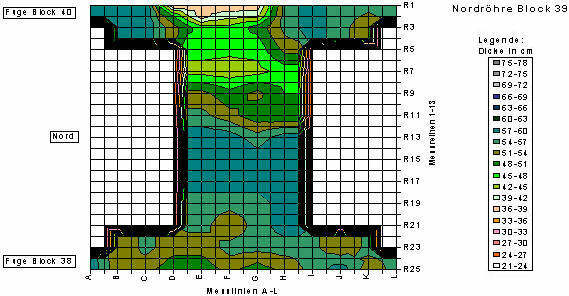 Fig 2: Test-columns: inspection of the homogeneity in the cross-section. Fig 3: Selection of the appropriate test-method by comparison. The test methods using radar, impact echo and ultra sound were compared  (Fig. 3). The methods using impact echo and ultrasonic echo proved to be suited for the purpose. The radar method was dismissed because of the impeding steel fibers and the scattering effect of the reinforcement bars' too big diameters. 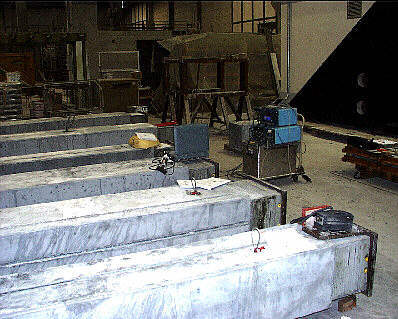 At beginning of production each column was tested at the production place immediately after completion with both methods, later on only the ultrasonic echo method was used. After having verified, that the production process was well under control the inspections where reduced to random testing. The inspection was executed as follows. The surface of the concrete the metering line was marked. The sensor heads were arranged along the metering line in distances of 10 cm. Finally the measurement was triggered and stored. Each side of the columns was inspected along one or two metering lines, starting from the head of the column. The measuring results were evaluated immediately after execution of the measurement. In case of strong reflections rebounding from the dense surface reinforcement, which is a typical effect, this influence was minimized by a little dislocation of the sensor heads and repetition of the measurement. The last inspections where executed on site with the columns installed in final position. There again both methods were used for measuring (Fig. 4 and 5). Fig 4: Inspection of the homogeneity of columns with the ultrasonic echo method. Fig 5: Inspection of the homogeneity of columns with the impact echo method. In addition to the verification of the concrete cover of all reinforced concrete buildings along that Railway according to the client's specification, the involved contractors executed nondestructive verification within their own quality surveillance. 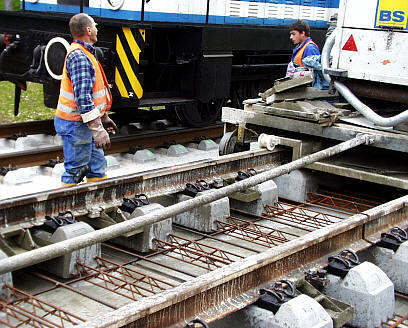 Fig 6: Partially completed sleepers are placed on auxiliary mounts. Fig 7: Sample length of the railway for testing, the concrete being poured. At the non ballastet rail track of the Intercity Express Railway between Frankfurt/Main and Cologne a concrete trough was erected above a foundation layer of hydraulically bonded gravel and sand. Within the concrete trough partially completed sleepers (the pre-concreted ends of the sleepers linked by reinforcement) are placed on auxiliary mounts, then brought into line and level and finally the concrete bed was poured completing the sleepers, too (Fig. 6). 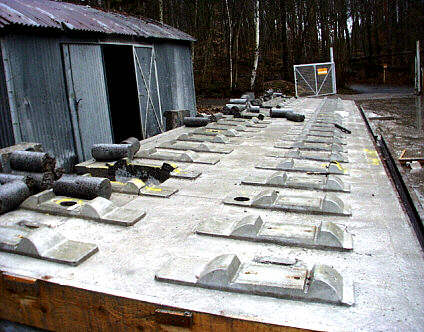 In order to reliably obtain the concrete free of cavities quality assurance methods were imposed on production. By means of the sample length of the railway it could be proved, that cavities below the pre-concreted parts of the sleepers can be detected with the impact echo method, if at least five masuring points are being placed upon each of that parts. After the successful proof of the aptitude of the methods random inspection of the completed railway was executed in several sections. It was necessary to dismount the rails and their anchoring devices, to free the concrete surface in order to be able to place the sensors. At this railway project was proved with nondestructive inspections by means of the impact echo method that the production process was so well-controlled, that no flaws or cavities occurred below the pre-concreted ends of the sleepers. In construction nondestructive acoustic and electromagnetic impact echo methods are used today already occasionally within the scope of internel quality supervision. The example of measuring the thickness of the inner shell of tunnels shows that particularly public clients want to ensure the quality of their buildings; they request quality assuring measures to be executed by the contractor to prove the quality of the completed construction. All methods applied in the scope of internel supervision have to be so reliable, that not only scientists are able to use them. Examples for successfully developed methods are the impact echo and ultrasonic methods. For use on the construction site appropriate measuring devices had to be developed which was successfully realized for the impact echo and ultrasonic echo methods. Especially the example of ultrasonic echo demonstrates, how quick a method is accepted, if for its use a device is developed, which can be handled easily by qualified personnel - without need for scientific qualification. When in the future measuring tasks in the construction practice demonstrate a need for inspection methods, these should be developed as quick as possible.